While channel-surfing late last night, I came across a movie I’d heard about but never expected to see on broadcast TV – the 1957 adaptation of Sophocles’ ancient Greek tragedy Oedipus Rex. 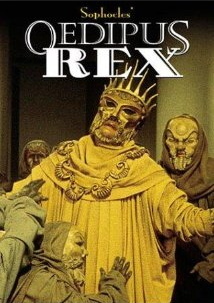 If you’re a fan of Tom Lehrer’s music, this is the very film he was referring to when he wrote his parody song “Oedipus Rex”, which he proposed as a song that might have helped the movie to be more successful at the box office. This movie is done in what possibly comes across as a jarringly unusual style, particularly to a modern audience, and particularly to an audience unfamiliar with Greek drama. First of all, the entire production is performed on a small set with few distinguishing features. Visually, it employs a limited color palette and only a few pillars, doorways, and steps. Also, the actors’ faces are never seen other than their mouths, as everyone is wearing masks. When Sophocles wrote this, it was meant to be performed live, in a quasi-religious setting. They were depicting the deeds and words of kings and gods, whose passions were outsized far beyond those of the common man. For centuries thereafter, the acting style of the stage continued to be exaggerated or stylized in ways that would seem unrealistic to most of us nowadays. And why is that? Why do we expect more naturalistic acting nowadays? One of the first reasons was the invention of motion pictures. These allowed us to be practically cheek-to-cheek with the actors and allowed – demanded, even – that they tone down the acting techniques required in a large theater. Then came television, which put this level of intimacy into every home. Additionally, television has usually been a medium that leaves us as the audience physically larger than the show we’re watching. We are no longer guests in their world; they are guests in ours. All of this has led us down the road of more naturalistic acting over the past century. For us as an audience to now go back and view the acting style of a bygone time, we have to adjust our ears and our expectations or we will miss a lot of what is going on. So it is with this film. Oedipus Rex was directed by Tyrone Guthrie, one of the titans of 20th century theater on both sides of the Atlantic. The movie was filmed in Ontario, Canada. The cast consists entirely of members of Guthrie’s acting company at the Stratford, Ontario Shakespeare Festival. Trivia: One of the chorus members in this film is a young William Shatner, though I couldn’t identify him by sight on account of the masks, and I never heard a voice that sounded like his, so he may not have any lines other than in unison with his fellow chorus members. It was an educational and fascinating weekend working with Campbell, a walking theatrical encyclopedia who had seen and done it all, from London to Broadway to Hollywood to many a touring show along the way. He told many other wonderful stories that you should ask me to recount sometime, and he offered invaluable insights to all of us about our individual work. Campbell died in 2009 at the age of 87. So in a very roundabout way, I felt as if I had a personal connection to this movie. I commend it to your attention, but with heavy advisement – it isn’t going to speak to everyone. If you’re unfamiliar with the material or the style, it could be tough going. But if you’re up for a glimpse into a mostly lost artistic style, you might want to seek this one out. A few other random notes: The screenplay was adapted from a translation by William Butler Yeats, and it felt to me as if this film must have been a strategic condensation of Yeats’ original (unless it was Yeats who condensed Sophocles’ original). With a running time of just under 90 minutes, certain parts felt a bit rushed. I can hardly blame Guthrie for doing this (if that’s what happened), as many classical drama pieces are several hours long if performed uncut. Also, I would be remiss if I didn’t mention the marvelous masks created by Tanya Moiseiwitsch. The longer one looks at them, the more expressive they become, particularly when used by such skilled performers. This begs the question: how do we know what a performance was like over 2000 years ago? Consider how much the English language has changed since Shakespeare's time. Perhaps this production was merely one interpretation of Greek drama. If Shakespeare had produced a play for television, would he allow for commercial breaks? It's certainly valid to wonder what drama was like 2000 years ago. The fairest answer to that would be to say that there's a lot we don't know -- but it wouldn't be accurate to say we know nothing at all. There are various accounts and descriptions of ancient Greek theater in the historical record, and the Guthrie production certainly attempted to implement as much of what we know as he practically could. There is no doubt that in doing it in the style I've described, he's gone a long ways away from modern realism and is definitely pointed in the right direction of ancient Greek style. As for what exactly he got right and what exactly he got wrong, we'll probably never know, but this is about as well as it can be simulated for now. As such, it offers some degree of illumination of the past. As for the translation, it was done by Yeats from Sophocles' original text in the early 20th century. This also touches on a subject I've wondered about for many years: how accurate are the Symphonic productions of a work that's over 300 years old? The real answer can only be found in the corpse of the composer. Having said that, centuries of enjoyment can still be derived from these works. The modern artistic landscape has been formed by generations of human endeavor. I wonder the same thing when I see ballet dancers performing a work that predates motion pictures.